You are here: Home » Interesting Stuff Around The Web » Is Facebook Killing Your Real-World Relationships? Is Facebook Killing Your Real-World Relationships? But are your digital relationships on Facebook – as well as other social networks such as, Youtube, Twitter and Google+ – affecting the the quality of or even killing your real-world relationships? Have a look at the results on the info graphic below – created by Schools.com – to get a basic understanding of the positive and negative effects social media is having on our real-world relationships. Some of the data is quite surprising. For example, did you know that 24% of social media users (those surveyed) have actually missed important moments where they should have been in person because they were too busy actually sharing those moments on social networks such as Facebook or Twitter. And 39% of the Americans who completed the survey spend more time socializing online than they do face-to-face, while 20% prefer texting or online communication to real-world interaction, and 33% are more likely to speak to someone new online than in person! Personally, I would always advocate the findings of a Hong Kong study that found real-world – as opposed to digital world – relationships involve more interdependence, breadth, depth, understanding and commitment. Please let us know what you think. 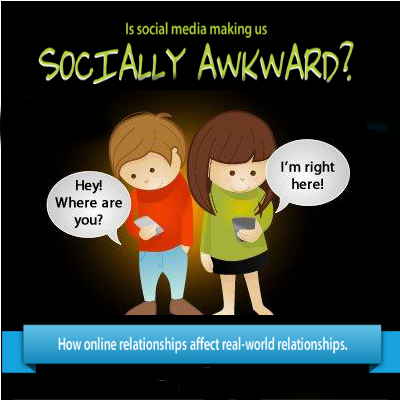 Is Facebook and other social media platforms enhancing or destroying our real-world relationships?